Cross River State (CRS) is taking giant strides towards achieving universal health coverage (UHC) and its vision “to be a leading Nigerian state with prosperous and healthy citizens”. In September 2016, the state unanimously passed the anticipated State Health Insurance Scheme (SHIS) Bill. Mandatory for all CRS residents, the CRS SHIS Bill creates the provision for an equity fund of one percent of the state’s consolidated revenue fund to go to vulnerable populations. 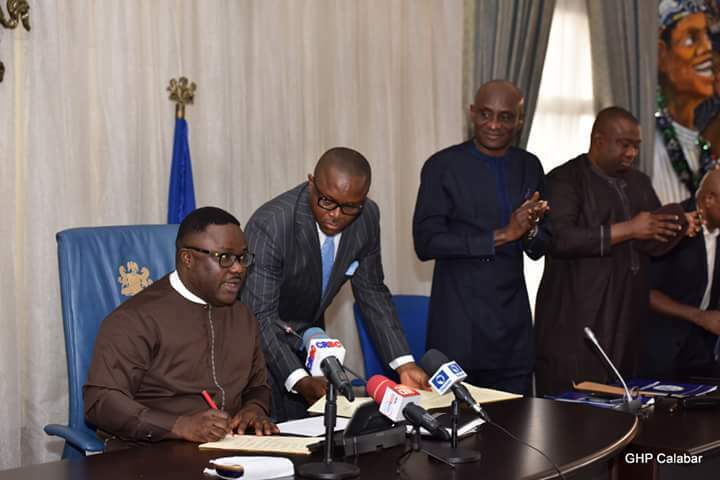 CRS Governor, Professor Ben Ayade, signed the SHIS Bill (tagged “Ayadecare”) into law on September 6, 2016. Prof. Ayade also approved the allocation of 150 million Naira (USD$500,000) to get the scheme started. Nigeria’s National Council on Health decentralized the National Health Insurance Scheme (NHIS) in 2015, in the gathering momentum for reforms supporting the goal of UHC. With less than five percent of the country’s population covered by health insurance, it was clear that the NHIS was not doing what it was envisioned to do. Those covered by the NHIS were mostly in the public formal sector i.e. federal government employees in addition to some largely unreliable and unsustainable, small community based health insurance programs available to some in the informal sector. The overall poor coverage was partially due to the fact that the NHIS was not mandatory, and was centrally operated in a decentralized nation of 37 federated, semi-autonomous states, who for various reasons, had not opted in to the nationally managed scheme. Decentralization has allowed the states to envision and establish health insurance schemes at the state level that better meet the needs of their people. To prepare policymakers to undertake the critical policy, institutional, and legal reforms required to successfully decentralize the NHIS, the USAID Health Finance and Governance (HFG) project and national partners organized a five-day training workshop to build the capacity of state actors from five states. The training allowed for needed dialogue between federal and state agencies, prompting further meetings and discussions. HFG helped guide the constitution of an implementation team and the CRS Ministry of Health’s financing unit, and advocated to key stakeholders. The project provided technical assistance to the House Committee on Health on making the case for SHIS on the floor of the House and on responding to questions and concerns at a public hearing. HFG put together a multi-dimensional case for health financing reform including the economic, social, political, and health benefits of health financing reform. The Chair of the House Committee on Health received a standing ovation on the floor of the House when he presented the case. HFG also provided support in drafting the Bill to ensure inclusion of key policies with implications for equity, access, quality, and efficiency. Once finalized, the SHIS Bill was presented to the CRS legislature and finally signed into law. HFG will further develop its work in Cross River state and provide technical support in the design and implementation of the insurance scheme by carrying out health financing core analytics that will guide policy options, developing key guidelines including operational and provider payment guidelines, as well as advocating to stakeholders whose support is critical to guaranteeing the success of the scheme.